Cross-posted from the Roosevelt Institute’s New Deal 2.0 blog. Originally published Monday, March 14, 2011. In founding America, as today, it could be hard to tell a finance policy from a finance scandal. Robert Morris, our first central banker, was the richest and most influential merchant in founding-era America — “financier of the American Revolution,” as his friend George Washington and later writers dubbed him. Morris did indeed finance the Revolution. As some historians have noted, the Revolution also financed him. More importantly, though, Morris wanted America as a whole to finance the upscale investing class, of which he was chief political exponent. The popular protests for democratic finance that I discussed in numbers two and three in this series add up to a movement against Morris’s finance policies and legacy. Understanding them requires knowing Robert Morris. Some have seen the man as a monster of avarice. Others de-emphasize his manifest corruption in favor of his patriotic contributions. Morris’s personal intensity — he was corpulent, gregarious, high-handed, bright — and even his profiteering in the Revolution (inextricable, perhaps, from America’s winning that war), can distract us from the cogently detailed finance policies that he dedicated to enriching American elites and consolidating American wealth. Morris spent his career waging war on democratic ideas about finance. He was immensely energetic. Born in Liverpool in 1734, he emigrated as a boy to Maryland and went to work as an apprentice to the august Philadelphia accounting firm of Charles Willing. That firm became Willing & Morris, dominating the American flour business in imperial trade, largely under Morris’s aegis. By 1776, Morris owned ships and warehouses and ran his own network of trading partners connecting Philadelphia, New Orleans, the West Indies, and (soon) even the China trade. 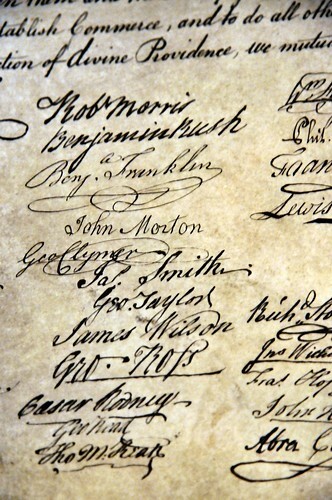 Capsule biographies routinely call Morris a signer of the Declaration. While he did resist the Stamp Act and helped supply the Continental Army after Lexington and Concord, Morris joined John Dickinson in the second Continental Congress in opposing declaring American independence — and like Dickinson, stayed home on July 2, 1776, when the watershed vote was taken. Dickinson, on principle, never signed the Declaration he’d opposed (and he immediately led his militia battalion to New Jersey to fight the British), but Morris was a pragmatist. With independence fait accompli, he placed his signature above the rest of the Pennsylvania delegates’. Then he went to work. Eschewing a military role, Morris took over the entire civil one, subordinating the Congress to its finance committee, which he chaired, effectively becoming the country’s wartime chief executive. He used his cash to supply the army and in the process used public money for his and friends’ private ventures. He gave enormous no-bid military contracts to cronies. He became so enamored of the war that in 1782, with peace finally in the air, he proposed to General Washington that he deliberately extend it: he feared losing the wartime unity essential to central government and central finance. Morris is rightly credited with bailing out the Congress early in the war by persuading leery investors to buy federal bonds, which looked weakly supported. He accomplished that feat by tipping off a circle of friends to a secret French loan he’d arranged, dedicated to paying interest on the bonds — not in crashing Continental paper, which big-time investors scorned — but in “bills of exchange” issued by European banking houses, as good as gold. Even better (for the investors): Morris got Congress to take its own bad paper at face value in payment for the bonds. If you knew Morris, you could dump $2000, say, in paper worth only $400 in trade, and pick up a comparatively stable $2000 bond paying 6% interest, tax-free, in the equivalent of hard, cold metal. Sweet! So the bonds sold. The blue-chip tier of the founding U.S. debt came to be held almost exclusively by a network led by Morris. Another plan Morris cooked up late in the war: Congress should call in the vast flurry of small IOU’s the army had issued to farmers and artisans in exchange for requisitioned supplies. Those forced loans amounted to a widely scattered face value total of maybe $95 million, which everybody deemed nearly worthless, for how would Congress ever pay on them? Long-shot gamblers were buying fistfuls of the chits at pennies on the dollar when Morris realized that if Congress privately agreed to pay them at face value, speculators would seek them out and buy them from ordinary people ignorant of the deal. The speculators could then exchange the chits in bulk at face value for federal bonds. A nearly incalculable fortune would thus be added to the public debt. The only losers would be the ordinary Americans forced to give up precious goods in exchange for scraps of worthless government paper. The purpose of all such efforts, and of Morris’s central bank itself, was to swell the domestic federal debt to huge proportions. That would make the merchant moneymen — those creditors who hated popular finance — into public creditors of the United States, equating American wealth with national purpose. (Morris had read Hume and wanted the U.S. to emulate England’s success as a financial power.) His bank existed in part to lend money to the Congress; in part to issue high-denomination paper — “Mr. Morris’s notes” — for government finance; in part to make risky, barely secured loans to its own founders for speculating in the real estate bubble and the public debt; and in no part to extend small-scale credit to ordinary people. One way historians look at Morris — a liberal one, really, because it’s meant to be balanced — is summed up in this mild assertion from the leading historian Edmund Morgan: “… though [Morris] seems to have mingled private gain too closely with public, he kept the United States almost solvent during the remainder of the war.” “Solvent” is a funny term in this context, but the real question Morgan avoids has to do with what a “solvent” America would mean to Morris and his supporters. A recent Morris biography by Charles Rappleye, too, presents itself as re-balancing the supposedly too critical work on Morris by, for one, the historian Terry Bouton. Rappleye and I will never agree (except as to Morris’s overlooked importance): where he dismisses Bouton’s book “Taming Democracy” as a “a broad-brush polemic,” I think Bouton provides the nuanced economics and layered political realism that Rappleye’s work (and Morgan’s) pointedly avoids. More important, though, are the political and historiographical implications of emphasizing Robert Morris’s patriotic efforts over his deliberately regressive economics (which Morris himself never made any bones about). Glossing over the purposes and results of Morris’s policy has the effect, intended or otherwise, of making it easy to ignore the thinking and misconstrue the actions of the democratic 18th-century Americans who so articulately opposed that policy. So next time in this series: some Americans who took Robert Morris on, including the farmer Robert Whitehill, the weaver William Findley, and the preacher Herman Husband. Also: the long and unlikely relationship of Morris and Thomas Paine. William Hogeland is the author of the narrative histories Declaration and The Whiskey Rebellion and a collection of essays, Inventing American History. He has spoken on unexpected connections between history and politics at the National Archives, the Kansas City Public Library, and various corporate and organization events. He blogs athttp://www.williamhogeland.com.